anti-Ectodysplasin A 抗体 (AA 218-267) | ABIN320882 Product No. 免疫原 Synthetic peptide located between aa218-267 of human EDA (Q92838, NP_001005609). Percent identity by BLAST analysis: Human, Chimpanzee, Gorilla, Gibbon, Monkey, Galago, Marmoset, Mouse, Rat, Goat, Hamster, Elephant, Panda, Dog, Bovine, Bat, Horse, Pig, Opossum, Guinea pig, Turkey, Zebra finch, Chicken, Platypus, Lizard, Xenopus, Stickleback, Zebrafish, Nematode (100%), Rabbit (92%). 预测反应 Percent identity by BLAST analysis: Human, Mouse, Rat, Dog, Bovine, Horse, Pig, Chicken (100%) Rabbit, Zebrafish (92%). 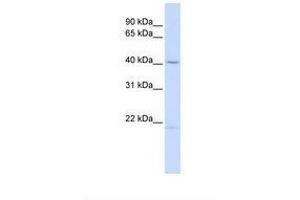 Usage: ELISA titer using peptide based assay: 1:625600. Western Blot: Suggested dilution at 1 μg/mL in 5 % skim milk / PBS buffer, and HRP conjugated anti-Rabbit IgG should be diluted in 1:50000 - 100000 as second antibody.